What’s happening with IBM Cloud Functions and PHP? 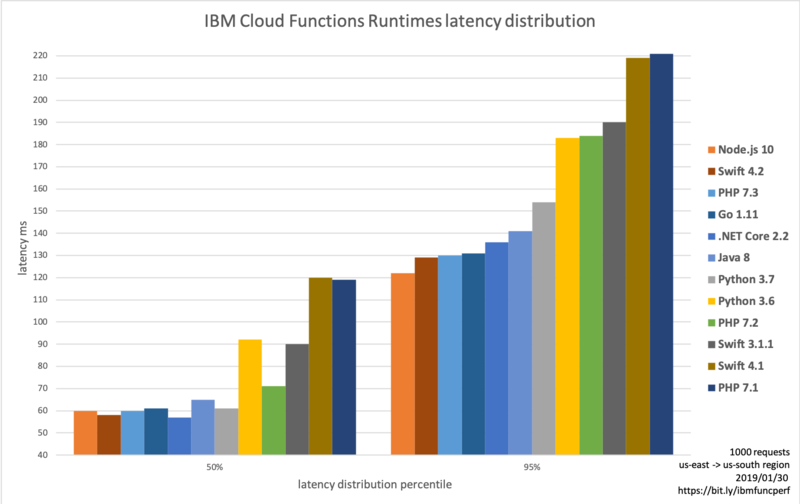 I’m excited to announce that IBM Cloud Functions officially supports PHP 7.3, which has been optimized for latency. The new PHP 7.3 runtime leverages a new web proxy built with Go that replaces the previous Python web proxy. This allows action invocations to respond faster by providing lower latency for blocking calls. Create the following PHP file. How much faster is PHP 7.3? As you can see in the graph below comparing warm invocation performance, PHP 7.3 is much faster than PHP 7.1 or PHP 7.2. Start new projects by using PHP 7.3 or migrate any existing actions. To set up a project and deploy your PHP 7.3 action, check out the IBM Cloud Functions documentation.